I have my 16 year old daughter to thank for this recipe. And I have my husband to thank (said sarcastically) for pushing me to make it. Long story short: he invited 3 adults over for lunch one Sunday and I had 15 minutes to come up with a hardy meal to serve them AND my family of 7. I honestly wasn’t expecting my kids to like this salad. It’s a little out of the ordinary, combining romaine lettuce with cooked pasta. I was planning (maybe even hoping?) that KitKat and I would end up eating the entire thing, but everyone – kids and adults alike – ended up gobbling it all up happily (note: I did increase the recipe to serve so many people). Also of note: I ran out of sesame seeds – kind of a big deal in a sesame chicken salad – but no one complained (I just wanted to point that out if you notice them lacking in the pictures). The sesame oil in the dressing adds that wonderful sesame flavor anyway. With the crunch of the almonds and wonton strips, I hardly missed them! 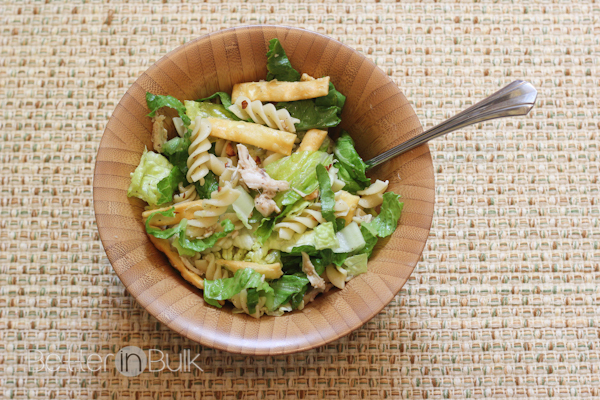 In a large bowl, combine lettuce, chicken, green onion, almonds and pasta. Combine dressing ingredients in a small jar. Shake well until sugar dissolves. 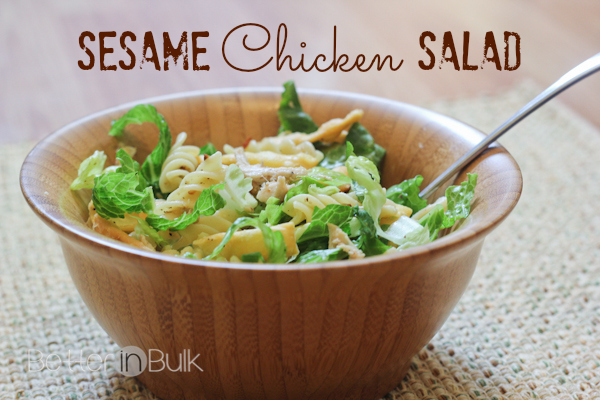 Top salad with 2-3 tablespoons of dressing and sprinkle with sesame seeds and wonton strips. Note: to make this 15 minute meal work, here are a few tips – 1) While the water is boiling/pasta is cooking, cook thin pieces of boneless chicken on a countertop grill/griddler that cooks the chicken on both sides simultaneously. Mine has saved me hours of time in the kitchen in the year that I’ve owned it! 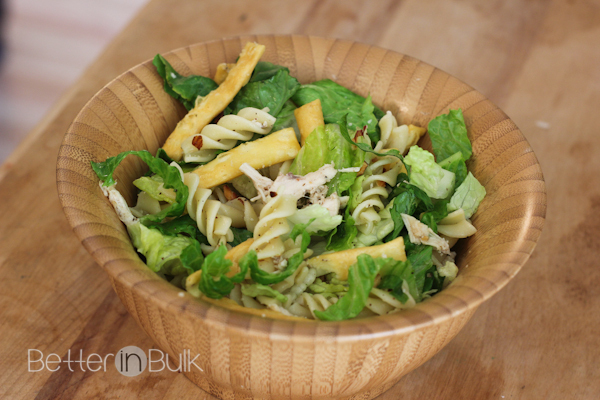 2) Chop lettuce and mix dressing while the pasta and chicken cook so that once those two are finished, you can throw the salad together quickly. 3) Save even more time by cutting up a rotisserie chicken that’s already cooked! Round off this light, refreshing, and QUICK meal with some fruit on the side. I’m so excited to be joining with a great group of bloggers every week to share 15 Minute Suppers with you. 15 Minute Suppers is all about getting supper on the table quickly with a homemade meal. All of the recipe shared are super easy take only 15 minutes or less to get on the table. Our lives are so busy that sometimes it’s hard to find time to sit down together at the table for supper. Well, say bye bye to the 30 minute suppers and HELLO 15 Minute Suppers! Wow this is delicious and I can’t believe it only takes 15 mins to make! This would be a great lunch alternative for me! This looks so nice and fresh! I love sesame, so this will be added to my list to make in the next few weeks. I love new salad recipes, and anything that I can get on the table in under 15 minutes (and this even has pasta!) is a winner for me. Yum! I could go for this right now! YUMMY! Delicious! Thanks for sharing. Pinning! That looks so fresh and tasty. I’m always looking for quick meals for lunch, so I’m definitely going to make this recipe soon. Oh yum! That looks so good. I love salads like this. I could eat them almost every day. Oh wow….I’ve never thought to add pasta and lettuce together. Love this and can’t wait to give it a try. Yummy, this looks like a really fantastic and tasty idea.. and only 15 minutes? What is not to love! Definitely need to try this soon! Wow, that’s far from a boring salad! Looks delicious!!! Pasta is definitely a staple in my house. Never would have thought to add the lettuce! That does sound really good. I am always looking for quick meals.